Lola A. Åkerström catches up with Hotel Rival Concierge and local insider behind The Stockholm Tourist – Sean Naughton – to talk Swedish Hospitality and cool Stockholm finds. Born and raised in Hawaii, Sean Naughton moved to Sweden when he was 18. Having a Swedish mother from Luleå meant he grew up with dual citizenship and speaking Swedish as well as experiencing Swedish food and customs like Lucia and Midsummer. After several years working in bar and restaurant management, Naughton switched over to the hotel business and has been working as concierge at Stockholm’s famous Hotel Rival since they opened 10 years ago. STS: When we think of hospitality in general, Swedes don’t necessary jump to the top of this list. Is this a myth or cultural stereotype? Sean: I think that this is mostly a cultural stereotype and not really true these days. It is true that Swedes are generally more quiet and unobtrusive when it comes to first time contact with strangers. And while this may be seen as cool and aloof by the untrained eye, it doesn’t take away from the general hospitable nature of Swedes. And this stereotype, I believe, was more apparent in the past than it is today. Today Sweden has one of the most well travelled populations in the world and this really can be seen in the way Swedes interact with foreign visitors as well as how the country promotes itself to visitors. It doesn’t hurt that most Swedes speak perfect English! This means you, as a visitor who doesn’t speak the local language, have a greater chance of striking up a conversation with a Swede on the streets of Stockholm than, say, a German on the streets of Berlin. What have you learned in all your years about the hospitality business in Stockholm in particular? It seems a lot of hotels and properties are pushing boundaries creatively. Any examples? The hotel business in Stockholm today is actually quite exciting with an amazing variety of hotels offered and more opening each month (or so it seems). One of the biggest hurdles I see facing hotels these days is attracting the younger, more internet savvy generation. They get their information and make their travel decisions in a completely different way than older generations. This new generation of potential guests is used to having all information at their fingertips. More and more, hotels need to be active on social media and they need to be creative with it as well (youngsters do tend to get bored and unimpressed easily). This is even truer when it comes to the business of being a concierge. These days, hotel guests can easily research their upcoming visit on their own (best restaurants, current museum exhibitions, popular sightseeing options, etc;) and they can book these themselves as well. Now, as a concierge, you need to find new ways to help guests with information and advice; whether through a hotel blog, Facebook page or something even more creative. Whatever research your guests have done in advance… your research has to be better! 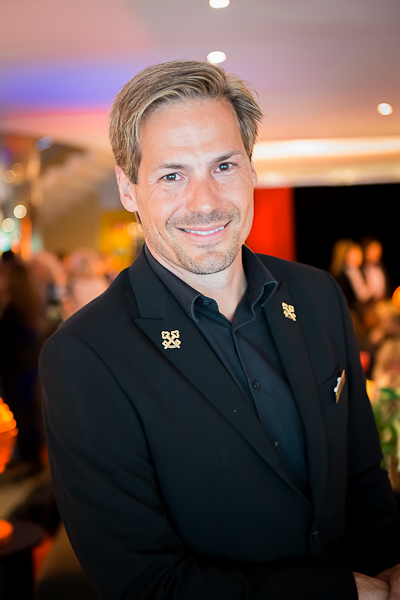 I am also a member of Les Clefs d’Or, which is an international union of hotel concierge. There are 7 members (and counting) at various top rated hotels in Sweden and we are busy putting together a full time Swedish chapter of the union. Les Clefs d’Or, symbolized by the crossed golden keys, promotes the highest standard of service in the hotel industry through a sharing of information as well as education (our motto is “in service through friendship”). It is great that the number of members in Sweden is growing! In fact, it seems to be a trend these days that more and more Swedish hotels choose to employ a full time concierge to take care of their guests’ needs. What do you love the most about your job at Rival? Everything! I love the combination of high service standards coupled with a relaxed, friendly attitude which gives you more of a “at home” vibe. I love the location on cool Södermalm. The Rival Hotel is in an authentic, residential Stockholm neighbourhood yet still within a short 15 minute walk from Gamla Stan, ferries to Djurgården and other popular sites. Another thing that I love is that while the hotel is on the relatively smaller side (99 rooms), there is also a Café, Bistro, 2 bars (3 during big events), conference rooms and a theater all in the same building… attracting both local, national and international guests. This means that there is always a pulse of life here which might be missing at a hotel of a comparable size. You also write the blog, The Stockholm Tourist, where you share some not-to-miss activities and experiences in Stockholm. How long have you run the blog and what inspires you to keep sharing? I started writing the blog in 2010. I often visit restaurants and museums as well as try out different sightseeing tours, both in my private life and through my work as a concierge. This, coupled with keeping myself updated by reading Swedish newspapers and different tourist websites, means that I have a constant flow of information. At first I would jot down facts in a spiral notebook… but it wasn’t very practical when I had to retrieve the information. So I went digital with a blog instead! Other benefits quickly emerged… like making sharing information with guests much easier (sending links to specific articles that might answer certain questions they have or at least give them more in-depth information) and giving the hotel added positive exposure (naming the hotel and linking to its website). It’s turned into an important tool in my day to day job, so no real inspiration is needed. There is always something to write about! Not only do I write about my own experiences, I also pass on useful tips… often information that I find lacking (especially in English). For example, a list of summer events and festivals or a list of holiday opening hours for the major museums. If you could recommend three offbeat experiences people should try when they’re in town that’s not too touristy, what would they be? That’s tough! Mainly because it depends a little on the person’s interests and what season it is. But, generally speaking, I do like getting visitors off the beaten path. First of all I like recommending guests (who have some extra down time) to put on their walking shoes and head out on one of the many well marked paths in the city. It might seem simple, but this the best way to really see the reality of how Stockholm is 33% water and 33% green area. For example, take a walk around the island of Kungsholmen, Djurgårds Canal or over Västerbron. You have the added bonus of stumbling on local watering holes during the summer months! Stockholm offers plenty of different sightseeing tours… from the mundane to the death defying. One recent addition that I think is a lot of fun is a food tour: guided walking tours where you eat your way through parts of the city. There are two companies that offer these tours for now: Stockholm Food Tours and Food Tours Stockholm. I am hoping that these types of tours will grow in scope and popularity. Another offbeat experience is for those looking for shopping bargains. Swedish fashion labels are very popular these days and I often get asked to point out the closest Acne, Wesc or Whyred boutique. This can, however, get quite expensive for visitors. Stockholm Quality Outlets in Barkarby lets you shop without the guilt by offering discounts of up to 70% from the downtown boutiques. I would also like to take this opportunity to wave a flag for the archipelago during the summer months! I think that too many visitors actually miss this fantastic natural wonder because they don’t take enough time to see it. It gets frustrating when visitors ask about the archipelago but only have two hours in the afternoon to spare. My number one tip is to give yourselves at least a full day to explore the archipelago at a leisurely pace!